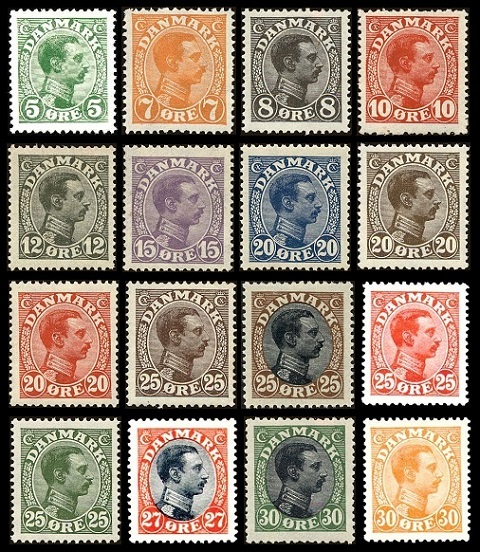 The new Danish stamps issued during this period featured a new security watermark, re-issued lower-denomination numeral-type definitive stamps, and a new set of portrait definitive stamps for the accession of a new Danish monarch. One security watermark was used for the stamps of Denmark between 1913 and 1930. The new watermark, shown above, will be referred to by the WMK number in the descriptions below. 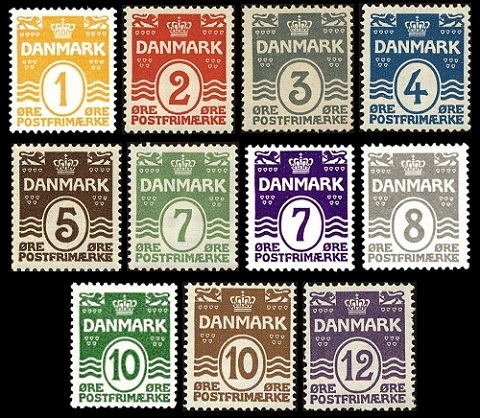 The eleven Numeral-type definitive Danish stamps of 1905 to 1917, shown above, were re-issued between 1913 and 1930. These stamps are typographed on paper with WMK 114, and they are perforated 14 x 14 1/2. 01 Ø. (1914 - Sc. #85) - Deep Orange. 02 Ø. (1913 - Sc. #86) - Carmine. 03 Ø. (1913 - Sc. #87) - Gray. 04 Ø. (1913 - Sc. #88) - Blue. 05 Ø. (1921 - Sc. #89) - Dark Brown. 05 Ø. (1930 - Sc. #90) - Light Green. 07 Ø. (1926 - Sc. #91) - Apple Green. 07 Ø. (1930 - Sc. #92) - Dark Violet. 08 Ø. (1921 - Sc. #93) - Gray. 10 Ø. (1921 - Sc. #94) - Green. 10 Ø. (1930 - Sc. #95) - Bister Brown. 12 Ø. (1926 - Sc. #96) - Violet. 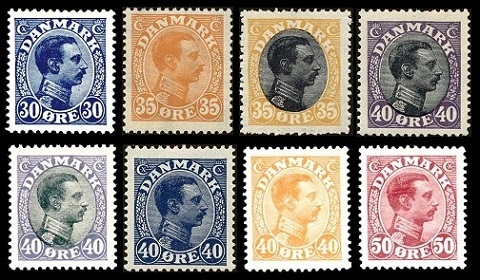 The thirty-five portrait definitive Danish stamps shown above were issued between 1913 and 1928. These stamps are all typographed, perforated 14 x 14 1/2, and printed on paper with WMK 114. There are actually not that many denominations in this series. Due to the fact that this series was issued over such a long period of time, there was a need for occasional color changes, causing duplication of many of the denominations. These stamps feature the right-facing portrait of King Christian X. 05 Ø. (1913 - Sc. #97) - Green. 07 Ø. (1918 - Sc. #98) - Orange. 08 Ø. (1920 - Sc. #99) - Dark Gray. 10 Ø. (1913 - Sc. #100) - Red. 12 Ø. (1918 - Sc. #101) - Gray Brown. 15 Ø. (1913 - Sc. #102) - Violet. 20 Ø. (1913 - Sc. #103) - Deep Blue. 20 Ø. (1921 - Sc. #104) - Brown. 20 Ø. (1926 - Sc. #105) - Red. 25 Ø. (1913 - Sc. #106) - Dark Brown. 25 Ø. (1920 - Sc. #107) - Brown & Black. 25 Ø. (1922 - Sc. #108) - Red. 25 Ø. (1925 - Sc. #109) - Yellow Green. 27 Ø. (1918 - Sc. #110) - Vermilion & Black. 30 Ø. (1918 - Sc. #111) - Green & Black. 30 Ø. (1921 - Sc. #112) - Orange. 30 Ø. (1925 - Sc. #113) - Dark Blue. 35 Ø. (1913 - Sc. #114) - Orange. 35 Ø. (1919 - Sc. #115) - Yellow & Black. 40 Ø. (1918 - Sc. #116) - Violet & Black. 40 Ø. (1920 - Sc. #117) - Gray Blue & Black. 40 Ø. (1922 - Sc. #118) - Dark Blue. 40 Ø. (1925 - Sc. #119) - Orange. 50 Ø. (1913 - Sc. #120) - Claret. 50 Ø. (1919 - Sc. #121) - Claret & Black. 50 Ø. (1921 - Sc. #122) - Light Gray, Dark Gray. 60 Ø. (1919 - Sc. #123) - Brown & Blue, Brown & Ultramarine. 60 Ø. (1921 - Sc. #124) - Greenish Blue. 70 Ø. (1920 - Sc. #125) - Brown & Green. 80 Ø. (1915 - Sc. #126) - Blue Green. 90 Ø. (1920 - Sc. #127) - Brown & Red. 01 K. (1922 - Sc. #128) - Brown & Blue. 02 K. (1925 - Sc. #129) - Gray & Claret. 05 K. (1927 - Sc. #130) - Violet & Brown. 10 K. (1928 - Sc. #131) - Vermilion & Yellow Green. 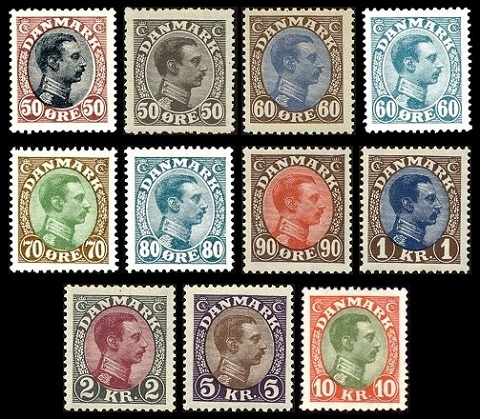 The three portrait definitive Danish stamps shown above were issued between 1913 and 1920. These stamps are all engraved, perforated 14 x 14 1/2, and printed on paper with WMK 114. These stamps also feature the right-facing portrait of King Christian X. 01 K. (1913 - Sc. #132) - Yellow Brown. 02 K. (1913 - Sc. #133) - Gray. 05 K. (1920 - Sc. #134) - Purple. The Five Kroner General Post Office type of 1912, shown above, was re-issued (Sc. #135) on May 3, 1915. This stamp is engraved, perforated 14 x 14 1/2 and printed on paper with WMK 114. The perforation gauge and watermark on this stamp are different than those used for the 1912 Five Kroner stamp. 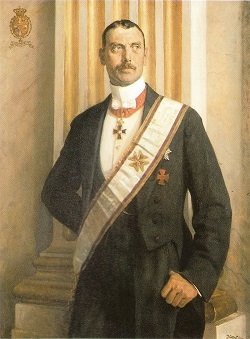 Christian Carl Frederik Albert Alexander Vilhelm (1870-1947) reigned as King Christian X of Denmark from 1912 to 1947 and as King Kristján X of Iceland from 1918 to 1944. During the German occupation of Denmark, he became a popular symbol of the Danish resistance. 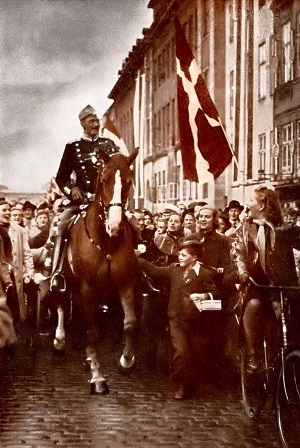 Every morning, he would ride his horse through the streets of Copenhagen, unaccompanied by guards, as a symbol of Danish sovereignty. He also helped to finance the transport of Danish Jews to unoccupied Sweden, where they would be safe from Nazi persecution. With a reign spanning two world wars and his role as a patriotic symbol for the Danish people, he is still one of the most popular Danish monarchs of modern times.